Since it is the time of dying sun, effort is also made to celebrate the dead with joyous remembrance. It is considered taboo to pass a burial site and not honor the dead. Natural energies are aligned towards protection, wealth, prosperity, security, and boosting self-confidence. Celebrants offer thanks in this festival also called Wine Harvest, Feast of Avalon, Equinozio de Autunno, Cornucopia, Winter Finding and Alben Elfred. The Autumn Equinox is when day and night are equal. A moment is taken to pay respects to the approaching darkness. 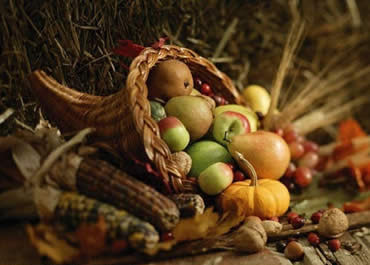 Gratitude is given to the waning sunlight, as the harvest is of this year’s crops is stored. Plants: Vines, Garlands (made of these various plants), Gourds, Pine Cones, Acorns, Wheat, Dried Leaves, Corn, Pomegranate, Ivy, Hazel, Hops, Cedar, and Tobacco. Herbs: Myrhh, Thistles, Tobacco, Oak Leaves, Hazel, Mums, Hops, Acorns, Marigold, Roses, Sage, Milkweed, Solomon's Seal, Asters, Ferns, Honeysuckle, Benzoin, Passionflower, Pine, and Cedar. Incense would include: Aloes Wood, Cinnamon, Cloves, Benzoin, Jasmine, Frankincense, Myrrh, and Sage. Celebrate with family and friends with some gorgeous food and spirits! Cook rice and oil in water for 50 minutes. Combine nuts, celery, onions, raisins, drained apple and lemon rind and set aside. Whisk together juice, salt and pepper, garlic and oil and add to cooked rice. Add fruit mixture to the rice (to which has been added oil, spices and juice) and mix well. May be served cold or heated. Mix juice, eggs, sugar and spices and blend thoroughly with potatoes using an electric mixer. Spread into a greased 9"x13" pan. Method: Preheat oven to 400 degrees and lightly spray an 8-inch square baking pan. In a mixing bowl, whisk together flour, cornmeal, baking powder, and salt. Stir in cranberries and set aside. In another bowl, whisk together eggs, milk, honey, and oil. Add to dry ingredients and mix just until blended. Pour batter into prepared pan and bake until top is lightly browned and a toothpick inserted in the center comes out clean, about 30 minutes. Mix starter ingredients with 3/4 pint of warm water in a glass jar. Stir, cover and leave in a warm place for 24 hours. This is your starter "plant". Feed the "plant" with 1 teaspoon each of ground ginger and sugar each day. After 7 days strain through a fine sieve. Dissolve the sugar in 2 pints of water. Add the lemon juice and the liquid from the "plant". Dilute with 5 pints of water, mix well and store in corked bottles for at least 7 days.Use strong bottles as pressure may build up which will cause thin bottles to explode. For the same reason use corked bottles rather than those with a more secure closure that will not 'give' under pressure.The amount of sugar in the final stage can be varied according to taste. What a great post! Fall is my favorite time of year. Those recipes sound delish and I'm going to try some of them. Thanks for sharing!